Baryte, or barite is a mineral consisting of barium sulfate. Some 77% worldwide is used as a weighting agent for drilling fluids in oil and gas exploration to suppress high formation pressures and prevent blowouts. 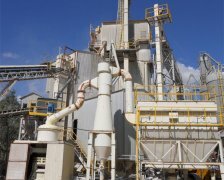 Other uses of barite powder are in added-value applications which include filler in paint and plastics, sound reduction in engine compartments, coat of automobile finishes for smoothness and corrosion resistance, friction products for automobiles and trucks, radiation-shielding cement, glass ceramics and medical applications. Baryte is supplied in a variety of forms and the price depends on the amount of processing; filler applications commanding higher prices following intense physical processing by grinding and micronising, and there are further premiums for whiteness and brightness and color. Historically baryte was used for the production of barium hydroxide for sugar refining, and as a white pigment for textiles, paper, and paint. Barite is processed by Barite grinding mill. The following is the introduction about CLIRIK HGM series barite grinding mill. HGM series Barite Grinding mill mainly applied to non-inflammable, non-explosive and brittle materials with Mohs’ hardness under six. Such as calcite, chalk, limestone, dolomite, kaolin, gypsum, etc, totally more than 100 kinds of materials. Product fineness can be controlled between 325~3000 meshes. The whole set HGM Barite Grinding mill consists of hammer crusher, bucket elevator, storage hopper, vibrating feeder, main unit, inverter classifier, cyclone collector, pulse deduster system, high pressure positive blower, air compressors and electrical control systems.